The first person to explain how wave theory can also account for the laws of geometric optics was Christiaan Huygens in 1670. At the time, of course, nobody took the slightest notice of him. His work was later rediscovered after the eventual triumph of wave theory. According to Huygens' principle, a plane light wave propagates though free space at the speed of light, . 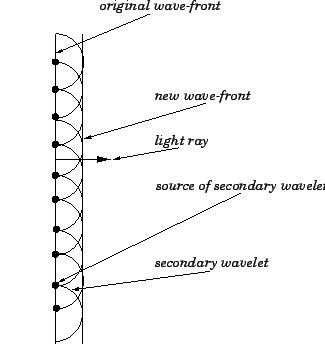 The light rays associated with this wave-front propagate in straight-lines, as shown in Fig. 85. It is also fairly straightforward to account for the laws of reflection and refraction using Huygens' principle.